A radical, ecosocialist take on the climate change crisis and the challenges confronting humanity in the face of global warming, resource depletion, religious intolerance, media manipulation and social injustice. As he was brown nosing the Crown Prince of Saudi Arabia at the G20 summit in Buenos Aires on Friday, President Emmanuel Macron of France confessed to the butcher of Istanbul that "I am worried." 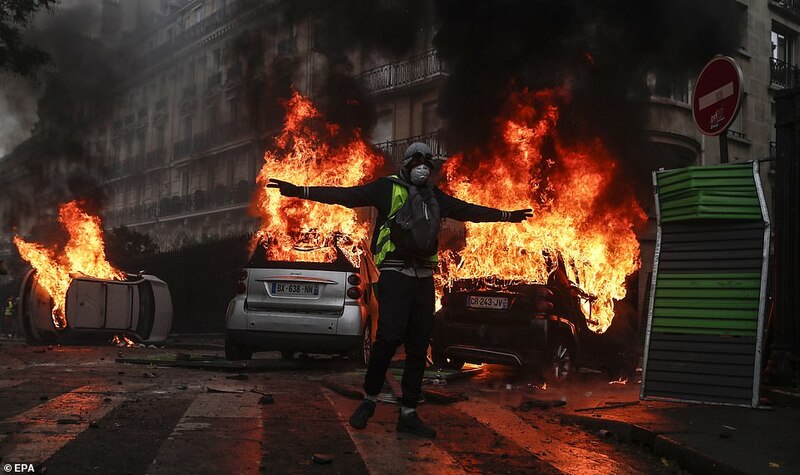 Which well he should be - this weekend, his capital city was engulfed in a further round of street protests and riots that saw cars torched, the Arc de Triomphe damaged and police firing tear gas into crowds in the distinctive gilets jaunes (yellow vests) of the protest movement that has swept the country. A tax on petrol as part of Macron's policy on reducing carbon emissions to tackle climate change sparked the initial demonstrations outside the capital. The jackets are a compulsory requirement for French motorists to keep in their vehicles in case of emergencies and so were donned to symbolise the problem the tax poses to many less well off people living in the countryside, where public transport has very low penetration. This last fortnight, the anger has come to the capital and shows little sign of abating. 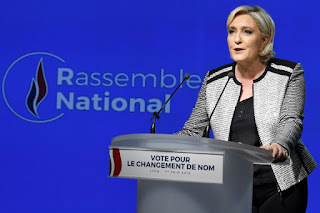 Both the far right Front National (now renamed the Rassmeblement National, or National Rally) of Marine Le Pen and a range of left-wing parties and groups have joined in what has become a reaction against the entire Macroniste project. Macron, a former Socialist Minister under neoliberal President Hollande, resigned and set up his own party to challenge as a centrist for the Presidency. He was elected barely 18 months ago offered up liberal platitudes and wild promises of national renewal. An Obama-esque character, the peculiarities of France's two-round voting system saw him narrowly lead a four-way competition between himself and the neofascist, conservative and radical left candidates in the first round, where he led with just 24% of the vote. With far-right Le Pen as his sole opponent in the second round, he saw her off by 66% to 34%, the latter still the highest vote for a fascist-sympathising movement anywhere in western Europe since the 1930s. Notably, the turnout fell by nearly five million between the two rounds and although his En Marche! movement swept to a big majority in Assembly elections a few weeks later, Macron's Presidency was built on sand from the outset. Like so many liberals, his response to fascism hasn't been to expose it and face it down for the dangerous and inhumane ideology that it is; instead, he has adopted parts of it, making noises he presumably believes will cut the ground from under Le Pen as she contemplates a further assault on the Elysee in 2024. He has legislated to increase the working week, to curtail immigration, re-introduce compulsory military service and cut taxes for the rich. And although his petrol tax is ostensibly an environmental measure, his Environment Minister resigned in August in protest at Macron's failure to take any significant measures to actually cut carbon emissions - many yellow jackets have been at pains to assert their protests are not about opposing action on climate change, but simply about how they are supposed to function day to day on a personal level. In a country as affected as any by the collapse of traditional industries and deepening inequality, Macron's association with a wealthy liberal elite has led to him tumbling to near-record lows of minus 46% in terms of public approval. This led to him being mocked, for once accurately, by US President Trump, whose own low poll ratings look like a triumph in comparison. Similarly, damage has been done through Macron's imperious manner, attested to in a number of tetchy exchanges with ordinary people where his moderate mask has slipped to reveal his evident disdain towards the poor as hectored and lectured about appropriate behaviour and the need for individual effort. He seems not so much a would-be Napoleon as an aspiring Roi Soleil. France however is now surfacing the fault lines of the age - Macron and his tired out liberalism look set to be sucked into the centrist vortex they have themselves created. In their place, neither the traditional conservative Republicans nor the old Socialist Party look set for any comeback. 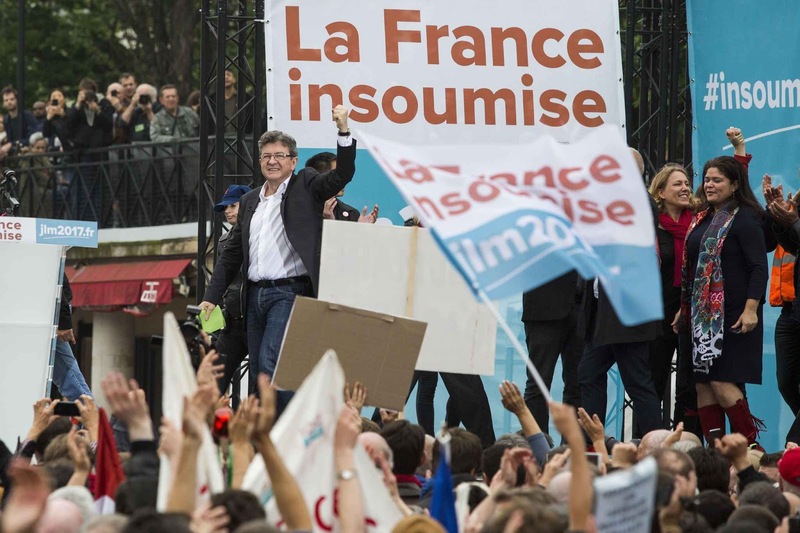 Instead, gradually, French voters are moving towards either the FN/RN, on the far right or, on the left, La France Insoumise (France Unbowed), a broad movement of former and new communists, ecosocialist greens and radical socialists. It is these two sharply opposed groupings or some successors to them that are likely to bring the neoliberal collapse to a head in the near future in the faltering Fifth Republic. The challenge for the Left will be that old chestnut of unity. The FN/RN hard right leads with 20% to Macron's En Marche's 19.5% in the latest poll for next June's European elections. The radical Left is on 23.5%, but this is split between six political groups (though excludes the old Socialist Party's 7% share). It would be a tragedy of Weimar proportions if the coming historic choice was to go the wrong way because of leftist reductio ad absurdum ideological spats or, worse still, distinctly un-socialist personality clashes. 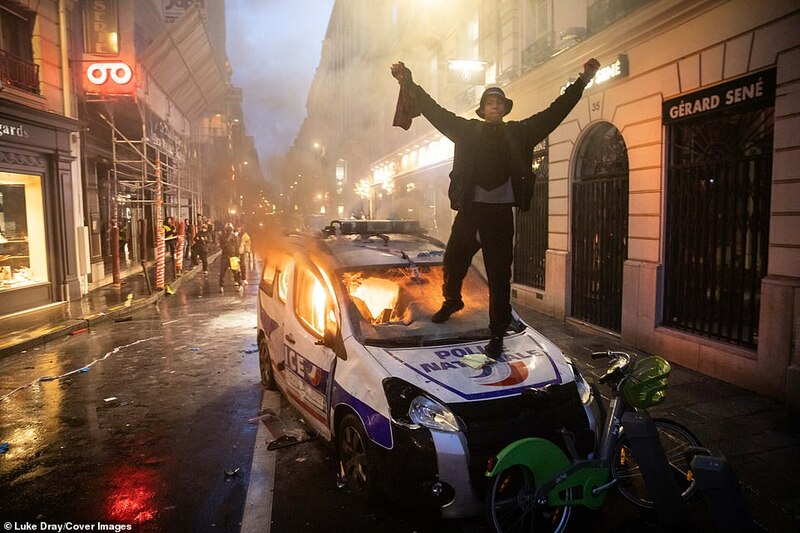 The stakes are too high; and Paris is burning. In each blog post, where words are highlighted in enlarged type, that usually means they contain a link through to further information on other websites. Just LEFT CLICK on the highlighted text and the web will take you there! "Sophie Scholl - the Final Days"
Fracking comes to Gloucestershire - All activists out!